Rock supergroup The Dead Daisies are the hardest working men in show business. 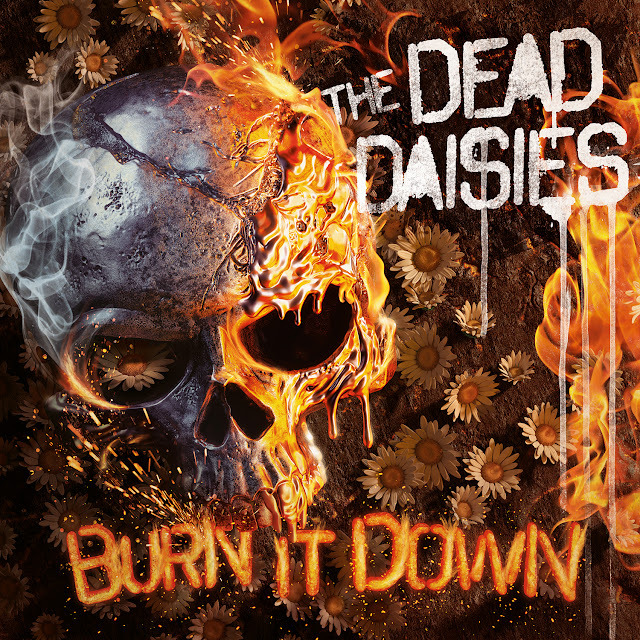 Since 2013, the Daisies have issued five records (four studio, one live) and built an international fanbase that grows with every tour. Of course, such feats are not at all surprising when considering the group’s pedigree. 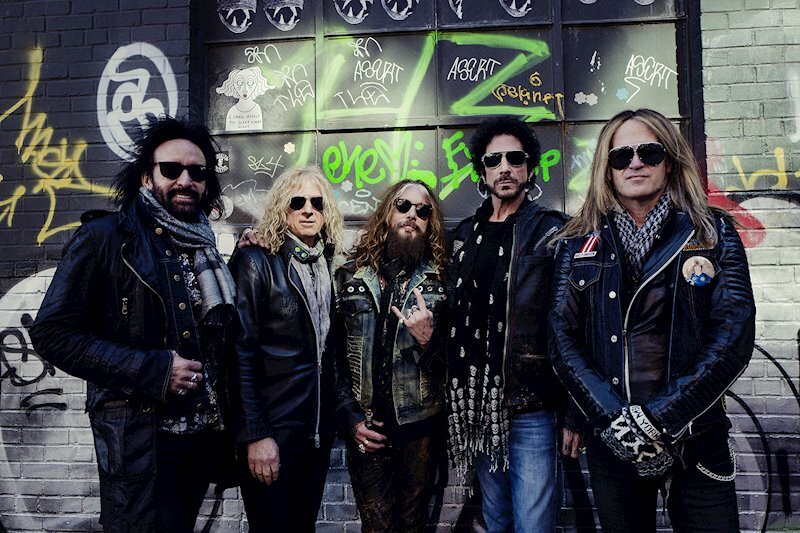 The Dead Daisies are currently comprised of guitarist/founding member David Lowy (Red Phoenix/Mink), singer John Corabi (Motley Crue/Ratt/Union/The Scream), guitarist Doug Aldrich (Whitesnake/Dio/Lion) and bassist Marco Mendoza (Thin Lizzy/Whitesnake/Bill Ward Band). Late last year, the band was joined by former Journey/Ozzy Osbourne/Bad English drummer Deen Castronovo, whose session work over the years includes his pristine performance on Hole’s 1998 album, Celebrity Skin. This incarnation is represented on the just-released Burn It Down, a blazing collection of tunes and easily the strongest Daisies recording to date. In addition to celebrating the release of Burn It Down, fan of the band’s ever-busy singer have two more reasons to be happy these days. 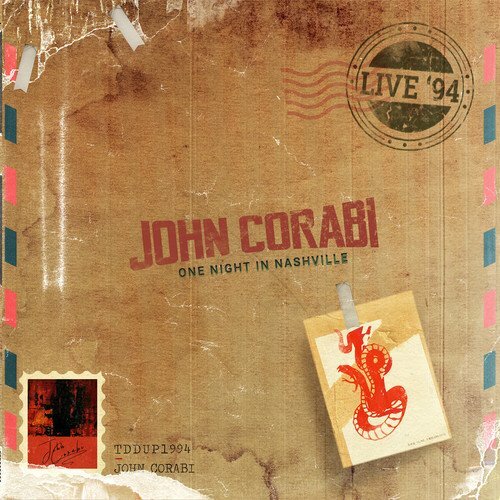 Earlier this year, Corabi released Live ’94: One Night In Nashville, a complete onstage rendition of his 1994 eponymous album with the Crue (plus “10,000 Miles Away” from the rare Japanese edition of the band’s 1994 Quaternary EP.) 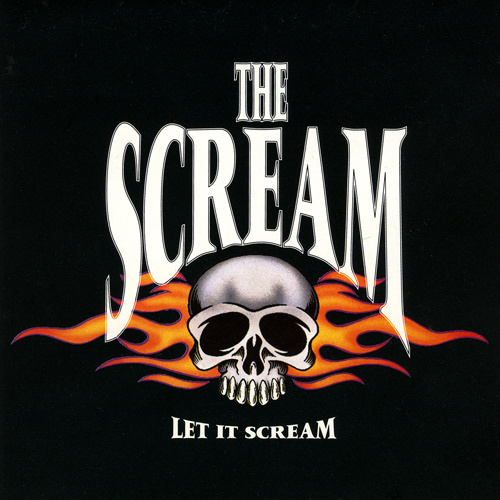 In the not-too-distant future, famed reissue label Rock Candy Records will release an expanded edition of Let It Scream, the 1991 album from Corabi’s pre-Motley Crue outfit, The Scream. John and I hit on all these topics in the following interview. We connected around this time last year to discuss the Daisies’ live album, and here we talking about the new studio record. You guys work fast, man! Yeah, it’s funny. I’ve been with the band for three years, and we’ve done four albums! That first year I was in, I really started working on the first record [with them], Revolución, in March. I believe it was March 10th, and we were done April 10th and went right on tour. Then, [former guitarist] Richie [Fortus] and [former keyboardist] Dizzy [Reed] got the call to come back to Guns N’ Roses and we brought [guitarist] Doug Aldridge in. Literally in January , we were back in the studio again; less than a year had gone by since the release of our last record. They’ve got this thing; it’s usually an album a year, like ‘Let’s go! Let’s do it.’ But it’s working, you know? That’s all I can say. With the current incarnation of the Daisies, you’re all spread out all over the country. How do the logistics work out with not only keeping the band active under those circumstances, but with the fact that you guys are writing songs together? That’s the other thing that’s weird about the Daisies. With pretty much every record that I’ve done with them, we’ve gone into a studio with absolutely nothing written. Everybody just kind of comes in with riffs or just very minimal song ideas or a verse or chorus. We get in a room for about 10 days, we write and we get anywhere between 17 and 25 of what I call ‘maps,’ Then, we go in and we start tracking. As we’re tracking, we’re kind of changing things up and tweaking it as we go. Once we get it to, ‘Okay, here’s the format,’ then I’ll go – either sometimes by myself or with a couple of guys from the band – and start working on lyrics or song ideas – melodies and lyric stuff. Then, I’ll go in and start singing. Even when I start singing – especially working with [producer] Marti [Frederiksen] – even the melody is changing as I’m singing and we’re tweaking stuff. There are times when I’m singing a song, and Marti or I will go back and we’ll listen to it and there will be a line or something that’s just like, ‘Ugh, I can do better.’ We’ll go back in the next day, tweak that, re-sing it and move on to the next song. But with pretty much everything that we’ve done – other than the live album, but the three studio records – we’ve gone in with nothing. We’ve written, recorded, mixed and mastered each one of the records in a month, maybe five weeks. Pretty much everything with the band is very quick, but we also do it very quick because we know we’re so scattered. We’ll usually meet in New York to write, and then we’ll come to Nashville – now that we’ve been working with Marti – and work until the record is done. We don’t take any days off; we’re usually in Monday to Monday every week, from probably 11 or 12 until 7, 8,9, 10 at night. We do that every day until the record’s done. I live in Nashville, but because the other guys are coming here, they’re all in hotels and away from their families. It’s costing money for the rooms, money for food and money for all this stuff. We’re aware of it, not like when we were younger. When we go to work, we go to work and we knock it out as quickly and efficiently as possible. It works for us. Obviously, the big change in the camp since the last time we spoke is that Deen’s now involved. He’s always been such a versatile drummer – there’s obviously the Journey stuff, but he’s also done some amazing session work over the years – and he slays on this new album. What has been the greatest impact he’s had on the Daisies? Deen kind of went through a little bit of a dark period a few years ago, and he had a little bit of a bullseye on his back. Other than David and me, he’s worked with all the other guys. He knew of the band and he was a fan of the band. Even though he’s still involved with [Journey guitarist] Neal [Schon] and doing some things with him, I think this is a bit more aggressive than what he’s done for the last 20 years in Journey, and he’s just having fun. He’s just happy to be there, and he’s really positive and upbeat about everything. The guy’s got a ton of energy. I didn’t think I’d ever meet anyone with more energy than [former drummer] Brian Tichy, but obviously I was wrong. Deen’s just happy to be here, and we’re just happy to have him. I’m excited about getting into rehearsals now – not just for his drumming, but being able to have that other voice for backing vocals. It’s gonna be sick. My favorite part of the new album is that one-two punch of “Burn It Down” and “Judgment Day.” How did those two particular songs come together with the vibe you guys captured? They sound like a live band jamming. Yeah, but even when we tracked the other songs, Deen was the room playing and everybody was in the room with him. With every record we’ve ever done, everybody sits around while the drummer’s playing, and they just kind of play along and feed off of each other. This record was no different. So there is a bit a jamming, especially at the end of ‘Burn It Down’ with that big, long, kind of crazy, Hendrix-y kind of jam. But ‘Judgment Day” was a little more involved. We kind of recorded that song a couple different times. We always believe in it, but we tried it, I wrote lyrics, I sang it and it wasn’t right. I re-wrote lyrics, sang it and it still wasn’t right. I think it was Marti or Doug who came up with an idea of, ‘What if we did the verses with an acoustic guitar?’ As soon as we tried it, we were all like, “Yes! That’s it.’ It kind of gave me a different vibe, and Marti and I sat down and wrote lyrics for it. It was like, ‘That’s it!’ But there is a bit of jamming as well with – like I said earlier – everybody sitting in a room together and feeding off each other. I want to touch a little bit on the other new release you have – Live ’94: One Night In Nashville. We’re actually approaching the 25th anniversary of the studio version of that Motley album next year. For some people I know, that’s the only Crue album they have – and they still play it all the time. Everybody who does an album hopes to catch lightning in a bottle and have material that holds up 25 years later. In the case of that record, and the fact that you have this live album that’s celebrating it, what in your mind makes that material stuff that really holds up after 25 years? It’s just one of those things, man…When I was doing [my] Motley record [tour], it was advertised as, ‘Motley ’94 live show from top to bottom, blah blah blah.’ I would walk off stage, and inevitably somebody would come up to me and go, ‘I’m a little bummed, dude. You didn’t play any Scream or Union.’ I’m like [sighs]. So I just said, ‘Let’s knock it on the head.’ Maybe for the 25th anniversary, I’ll go out and do a few more shows, but I’ve got so much material – from The Scream to Motley to Union to my solo stuff and now The Dead Daisies. When I go out with my solo band, I play a little bit of everything, trying to make everybody happy. It is what it is, and I think the guys did a great job playing the stuff. I’m extremely proud of my son [Ian], who played drums on the album. I don’t know…I’m just moving forward and doing The Dead Daisies, the [Motley] live album is out and now they’re re-releasing the Scream album later in the year. At some point, I’ve got a brand-new electric studio record due solo-wise. I’m just keeping busy. I love that Scream album; it’s one of my favorite records from that era to this day. Obviously, the Motley thing changed the course of your career. When you look back, do you get a sense that maybe The Scream has unfinished business or maybe that a second album could have been a reality at some point? Well, they did do another record without me, with a different singer. They changed the name to DC-10. It doesn’t sound anything like The Scream. Honestly, a couple of years ago, we were offered to go over to Japan and do a festival over there for an astronomical sum of money. We all kind of sat down and talked about it. Unfortunately, Walt Woodward III, our drummer from The Scream, passed away six or seven years ago. We were just like, ‘Man…no.’ That is what it is. My biggest thing with The Scream was, I was noticing that the fans were paying these astronomical sums of money for the album on eBay and these websites. I just wanted the album to be out; if they want to download it, they can for 99 cents a song or download the whole record for ten buck instead of spending $200 to $500 for a copy of the record. Just put it out and make it available to people [and] put it on iTunes. I’m just happy that Rock Candy out of London, England is putting the record out. They may add a couple of bonus live tracks to it, and we’ll see what happens. But it is what it is. I think it was a great album, it was a great band and it’s become this little cult album that a lot of people still would like to grab or they had it and don’t anymore and want to get it. I’m excited that it’s coming out again. Everyone in the Daisies has been around this business a long time, and you all bring that experience and success to the table. You’ve obviously worked with a lot of different people. How has the experience of working with these current guys most impacted you as an artist and musician? With every other record that I’ve done up to this point, it was like a year writing and preparing. With The Scream, we got a record deal and they put us in a room and said, ‘Go write.’ Then, we did the Motley record and took a year – maybe a little longer. We just wrote, and it was the same with Union. The one thing that I’ve learned is how to communicate with the other guys in the band. Yeah, we have our disagreements; we have our arguments or whatever, but it’s done on a more adult level than when I was 20-however years old back in The Scream. When somebody disagreed with me, my first inclination was to throw my fists up and just start swingin’ – as with the other guys in the band as well. We’ve kind of learned how to communicate with each other as older men, but I’ve also realized that it doesn’t take a year to do an album. (laughs) You can literally go out and just put your nose to the stone and just get it done. So far, every record that I’ve done with the Daisies has been very quick, and we’ve gotten great reviews on all the records because I think they’ve just been honest. We’ve kind of gone with our first inclination or our first gut feeling with things. We’ll write a riff [and we’ll be like,]’ ‘Yeah, this rocks!’ Boom! We tweak it and we go. Everything’s just been really honest, and I think that’s definitely one thing that’s changed my opinion on writing.